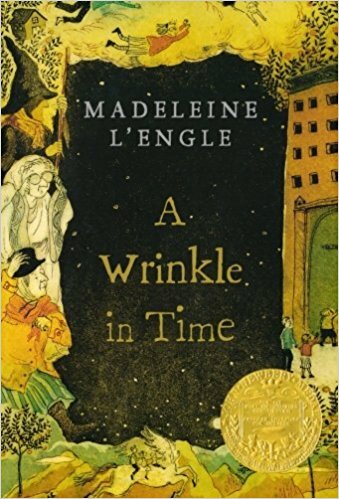 A Wrinkle in Time is the first novel in the Time Quintet by Madeleine L’Engle. Meg Murry is an unusual child from an unusual family. Her mother Katherine is a scientist, as is her father Alexander – who has been missing for a while. He was working on tesseracts – and their new neighbor Mrs Whatsit seems to know more about the topic. When Meg goes to investigate a haunted house with her school mate Calvin and her genius brother Charles, she encounters Mrs Whatsit again – together with Mrs Who and Mrs Which. They prompt her to go looking for her father – all through the universe. A Wrinkle in Time is a nice read that didn’t completely win me over – I’m still on the fence about whether I want to continue reading the series. That being said, there is a lot that can be enjoyed about the book, even when you didn’t grow up with it. I enjoyed A Wrinkle in Time, but at times it really irritated me. Mostly that happened for one of two reasons: the first one was that every once in a while it suddenly hit you over the head with Christianity and since I’m not Christian and ambivalent about churches, that really didn’t work for me. The second one was that some things just happened way too quickly, probably because the book is aimed at children who are not necessarily as patient, but for whatever reason, there were things that I would have liked the story to spend more time with. Fortunately these irritations were infrequent occurrences and so I really did like reading the book most of the time. I found the three Mrs extremely entertaining and the children very likeable and easy to root for. I definitely enjoyed more about it than I didn’t enjoy. I’m just not sure if I enjoyed it enough to actually continue reading. Maybe the movie adaptation will give me a push to continue. Summarizing: Good, but not great. This entry was posted in books, female writer and tagged A Wrinkle in Time, Madeleine L'Engle, Time Quintet by kalafudra. Bookmark the permalink.